COMBIfast - Hortiland Holland B.V.
COMBIFAST series have been developed to offer a high quality, 100% soluble NPK product which can be applied throughout the year under normal growing conditions both via drip irrigation systems as well as foliar applications. 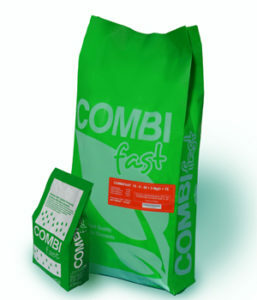 Combifast is suitable for drip irrigation and foliar applications. Combifast consists of small homogenous particles which dissolve evenly and easily. The available types meet the crops needs during all growth stages. The basic components of Combifast are of high quality and free of chlorine and other hazardous elements. Combifast fertilisers can be applied with all usual plant protection products. Due to the 100% water solubility, combifast fertilisers do not block the nozzles of the irrigation systems or spraying equipment. All microelements are in chelated form. When applied by foliar application no stains or residues remain on the fruits or leaves.